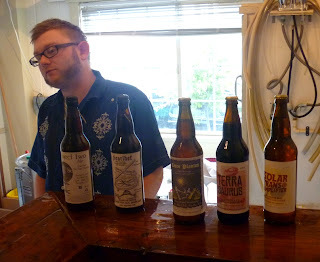 Epic Ales is a microbrewery run by Cody Morris with a tiny bar & tasting room in the KR Trigger Building in SoDo. You'll need to ring the doorbell to be shown in. On Saturdays he teams with a chef and presents upscale meals in the "gastropod," an upstairs room with lovely old wood and signs. The room contains a lovely old bar made to look like a ship, which the landlord obtained from an old tavern in Spokane, and which now juts its bow through the wall into the next room. The beers are adventurous and use some offbeat ingredients, and the food and beer pairings of the gastropod show the same creative considerations. I had a lambic made with fresh hops called Zero Minute IPA. Belgian-styles are not my personal favorites, but it was nice to have an intriguing set of tastes so different from the typical offerings.